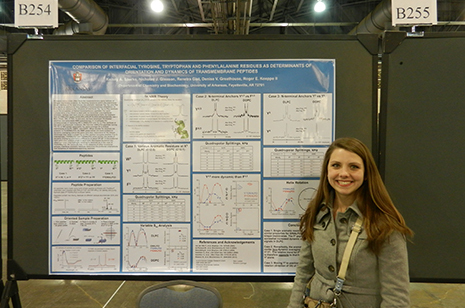 Kelsey Sparks presented her groundbreaking research at the 2013 annual meeting of the Biophysical Society in Philadelphia. FAYETTEVILLE, Ark. – A University of Arkansas research team shed new light on the molecular properties that drive the nervous system. Their work was recently published in Biochemistry, one of the top journals in the field. Kelsey Sparks, an alumna of the J. William Fulbright College of Arts and Sciences and the Honors College, who is currently pursuing a medical degree at the University of Arkansas for Medical Sciences, led the research effort as an undergraduate, working for three years on what became her capstone honors thesis. Sparks is the first author on the article, giving her primary credit for the discoveries. Other undergraduate coauthors were Fulbright and Honors College alumna and Sturgis Fellow Rebekah Langston, who currently holds a research position at the National Institutes of Health, and Renatra Gist, an alumna of Tennessee State University who completed a summer National Science Foundation-sponsored Research Experience for Undergraduates at the U of A. The paper, “Comparisons of Interfacial Phe, Tyr, and Trp Residues as Determinants of Orientation and Dynamics for GWALP Transmembrane Peptides,” was featured on the front of Biochemistry’s website, an unprecedented honor for undergraduate work, according to honors faculty mentor Roger Koeppe, Distinguished Professor of chemistry. Using nuclear magnetic resonance spectroscopy, the U of A team altered the amino acid sequences of model peptides and incorporated deuterium labels to study how they move within a model for the outer membrane of a cell. “It’s like doing an MRI on a molecule,” Koeppe said. Several of their findings were surprising: for example, some of the amino acids that could form hydrogen bonds with membrane lipids caused their host helices to move faster than their non-hydrogen bonding counterparts. The Honors College supported Sparks’ work with a research and travel grant. Other members of the research team who are coauthors on the article are Nicholas J. Gleason, Denise V. Greathouse and Koeppe. Research on the molecular frontier of membrane biophysics continues in Koeppe’s lab, where five Honors College students are currently exploring additional questions related to the research published in Biochemistry.